British mystery fans will welcome Lynda La Plante’s latest novel, number seven in this series, featuring Detective Chief Inspector Anna Travis. One caveat before starting: Do not sit down with a meal and open this book at the same time. The first pages present a shocking murder from the victim’s point of view—guaranteed to unsettle your appetite. The rest of the novel follows the blood line of title as Anna and her team trace back to this murder from what appears to be a routine missing persons case. By the time it becomes a missing body case, the trail has grown cold, putting Anna at a disadvantage from the start. Ultimately it becomes a trap-the-killer case after the investigators peel back layer upon layer of lies and depravity. 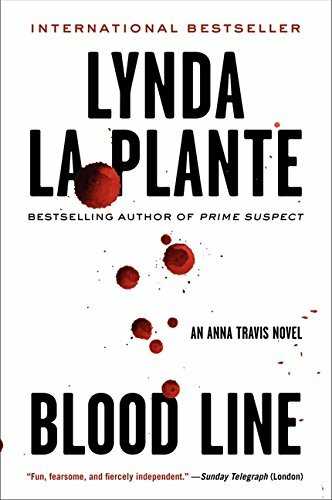 Ms. La Plante makes these more chilling through her businesslike narrative, creating a quietly compelling police procedural. Throughout, Anna wrestles with the emotional aftermath of losing her fiancé to a previous murder, along with performance pressures resulting from a promotion. These give the story a dual theme of building and rebuilding. First Ms. La Plante builds a complex case that takes weeks to get off the ground for lack of evidence—hampered from becoming a murder case by lack of a corpse. Then she interweaves Anna’s process of rebuilding her confidence, her relationships, and her life. The author includes enough backstory to inform new readers—a tad redundant for established fans. Those readers, however, may better understand Anna’s relationship with her boss, Detective Chief Superintendent James Langton, who is? isn’t? was? might be? her lover in this volume. He’s the one who pulls her into the inquiry, and alternately drives and counsels her or threatens to remove her from the case because of the time she spends out on a limb pursuing leads. Despite internal conflicts, the investigation marches along clue by clue at a steady, page-turning pace. The plot twists like a snake, exposing double lives and twisted characters causing Anna to chase a lot of red herrings. She manages to pick up a detail or an insight along each dead-end path to piece together an inventively brutal crime and break a brilliant liar’s story. Readers who pride themselves in solving whodunits will be hard pressed to put together all the pieces before Anna. At more than 450 pages, this novel should satisfy most anyone who enjoys getting lost in a book. Ms. La Plante has mastered the art of developing characters while keeping a story moving; and she enriches it with information such as how investigations work, as well as multiple viewpoints, such as that of her homosexual sergeant. She also introduces uncommon cultural viewpoints of surfers and salon workers—as well as those of the more common criminal fare. Carolyn Haley is a broadly experienced writer and editor who operates DocuMania, providing production support for editors, writers, and designers. She is also the author of four books: The Möbius Striptease, Open Your Heart with Gardens, Into the Sunrise, and The Aurora Affair.